The news: World Population Day was on Friday and the UN&apos;s new data makes one thing very clear: Our planet is more crowded than ever. 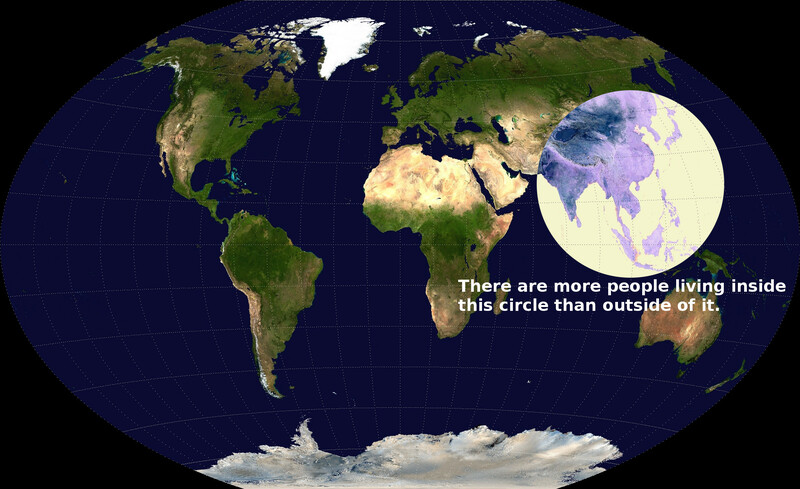 The area above consists of China, India, Indonesia, Bangladesh, Japan, the Philippines, Vietnam, Thailand, Myanmar, South Korea, Nepal, Malaysia, North Korea, Taiwan, Sri Lanka, Cambodia, Laos, Mongolia and Bhutan — where roughly half of humanity resides. But the trend is slowing down. While the global population has been furiously expanding in the last few decades, research indicates that the pace will slow down as aging populations die off and younger populations become increasingly selective about having children. Still, for the foreseeable future, Asia remains the population center of the world and the respective governments will have to figure out how to share their resources adequately among an ever-expanding population.